Piggs Casino is a member of The Palace Group of online casinos and is licensed by the Lotteries and Gaming Authority of Malta. It has been awarded to eCOGRA seal of approval for safe and fair gaming. The percentage payouts for the casino’s games are reviewed by independent auditors. 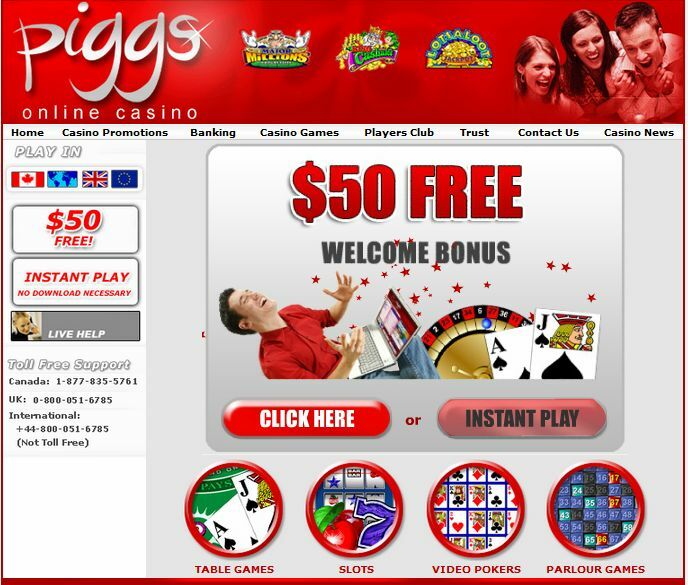 Piggs Casino offers a great suite of online casino games, both in their downloadable version and in their flash casino. There are bonuses for players to enjoy and a loyalty program to join which can earn you free casino credits and access to special promotional offers. Customer service support is available 24/7 and the casino accepts a number of safe payment options. Piggs Casino is powered by the online casino software provider, Microgaming. The software is available in a downloadable version and a no download instant flash version. Piggs Casino offers all of your favorite online casino games. These include table games such as four variations of roulette, a large variety of variations of blackjack, 3 card poker, pai gow poker, baccarat, war, craps, keno, red dog, sic bo, scratch cards and more. There are multiple variations of video poker, including 4, 10, 50 and 100 play games. There are more than 100 slots games including reel slots, video slots, bonus slots and progressive slots. There are more than 10 progressive jackpot games at the casino. New players at Piggs Casino are eligible for a welcome bonus on any deposit they make over $20. You are eligible for a 100% match deposit bonus up to $50. New players will also receive 500 free club points to get you started in the casino loyalty program. 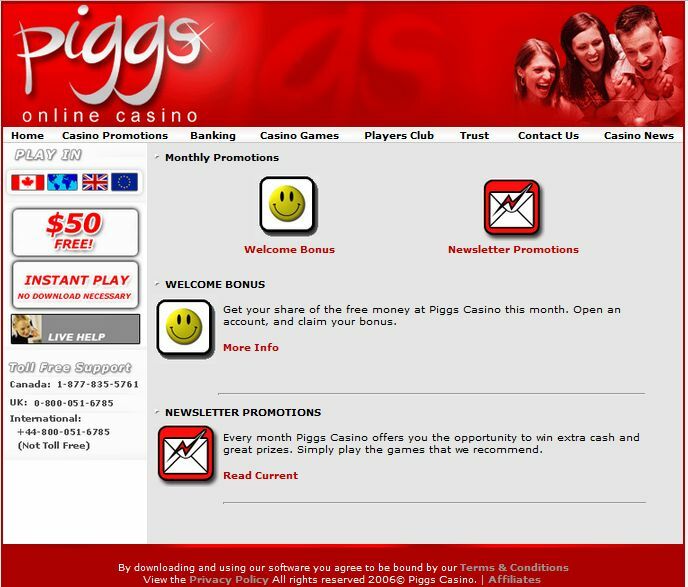 Piggs Casino also offers special bonuses and promotions which are advertised in their newsletter. To find out about current bonus and promotion offers, you must subscribe to the newsletter. Current newsletter promotions include the $2,000 Ultimate Poker Contest, the $2,000 Bonus Slots Bonanza and the $2,000 Progressive Table Party. As part of the loyalty club, for every $10 that you wager, you can earn club points. As you accumulate club points, you can convert them into casino credits. They are also offering double club points on selected 3 reel progressive slots games and triple points on April’s new games. There are four tiers in the loyalty program – blue, silver, gold and platinum. The higher you move in the program, the more club points you earn and therefore the more bonus points you receive. If you have any questions when playing at Piggs Casino you can contact their customer service support team who are available via email, telephone and instant live chat. They are available 24 hours a day, seven days a week, 365 days a year. They also offer email support in Italian. Piggs Casino accepts a variety of safe and convenient payment methods. These include credit cards, switch, solo, eCheck, InstaDebit, NETeller, Click2Pay, Citadel, Eco Card, Moneybookers, UseMybank, Delta, Paysafe Card and Ukash.